The Pangolin pleated leather sofa is designed by Egg Designs and manufactured in South Africa. This Sofa was inspired by the plight of the fragile Pangolin, the most illegally trafficked mammal in the world. These beautiful creatures are cared for by the Pangolin Men of Zimbabwe, as part of the Tikki Hywood Trust and 10% of the sales of each sofa is donated to the trust. In the wilds of Zimbabwe, five men are taking an afternoon stroll through the bush. Their steps are slow and unhurried as they wait for their charges to catch up. It’s a process that happens every day. Each afternoon, as the desert sun starts to lower in the sky, the Pangolin carers each carry one of these four-legged pine cones into the bush where they can forage for dinner. After toting them over their shoulders they then carefully lower the Pangolin onto the pathway so that these mini Prehistoric creatures can search for ants and termites. This contemporary retro style sofa has a pleated leather back reminiscent of the overlapping scales on the Pangolins back. The internal structure is comprised of various densities of foam. There are various leather options available. Founded by South Africans Greg and Roche Dry, Egg is a unique perspective in contemporary furniture, with a spirit that’s deeply rooted in Africa. We believe Egg has a distinctive African design dialect. We dream that our products will not be judged only by their function and form, but by the beauty of their eternal narrative. In everything we create we must answer the question, “Is it Egg enough?” Egg is an amalgamation of heritage, passion, meaning and African soul. It stands the test of time. It’s curiosities that make you smile. Its love and truth that can be seen from afar, and equally found in the minutest details. That’s why every piece we craft comes from Africa and carries within it a part of the African identity. We’re a melting pot of tribal craft, European heritage and modern luxurious expression. “If it’s not Egg enough, it’s not worth doing!” We have widened the prism of contemporary African design by creating Modern Collectibles, high end Furniture & lighting, as well as bespoke interiors inspired by an African provenance for a modern, international customer. An English worn leather Chesterfield sofa. 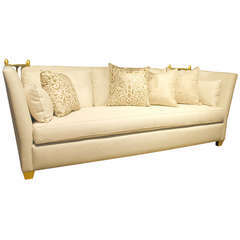 Supported by bun feet on brass casters stands this very comfortable sofa in a fine worn leather. Midcentury Scandinavian Modern sofa in camel colored leather Reminds a bit of the designs of Nanna Ditzel and Arne Norell.